Slack. Asana. Voxer. We live in a time of amazing software that connects us and allows us to communicate for business. … but is it good? And is it better than email, which many are saying it is? Well, at the risk of sounding like a curmudgeonly old man, I’m not convinced we’re in a better age. I’m experiencing inbox fatigue — not fatigue from my email inbox but rather fatigue from the sheer number of inboxes I now have to manage. This is not me. 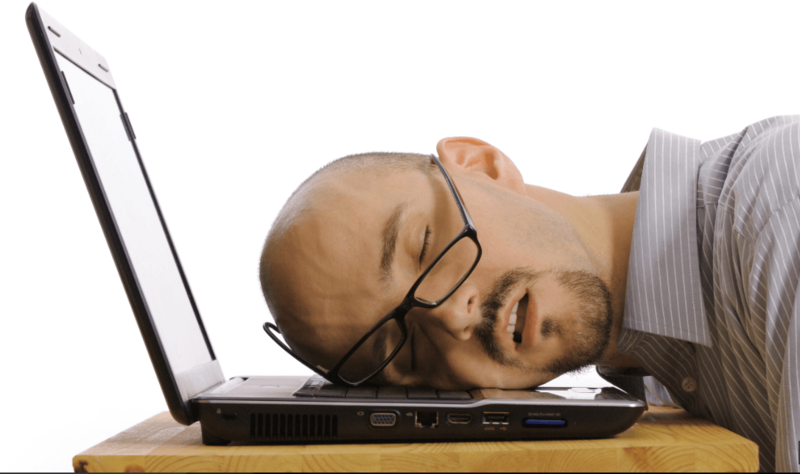 It’s a stock photo… doubtlessly of someone experiencing inbox fatigue! Email was my primary inbox and in those early days I also used it as a project management system. I would accept projects in my email, work on them on my desktop, and then deliver them back through email. And my phone — people would call and if they had to leave a voicemail then I’d get back to them. These first two were my primary inboxes. I also had an account on a site called Guru.com, which is a job-posting site that people would use to hire freelancers. I ran a bunch of my projects through there as well, so it was technically a third inbox (although those projects were automatically emailed to me so I could still monitor my Guru account in my email inbox). Over time, things changed: There was the concurrent development of the growth of my own business as well as the advancement of technology. I also got my own act together and started managing my projects in another system instead of email (I tried a couple different ones but really clicked with Evernote, which I still love today). It was a lot, and growing, but also manageable. …AND NOW THERE’S INBOX OVERLOAD! I have several clients using Slack, several more using Asana, and several more using Voxer, on top of the systems I’ve already mentioned above. Yes, these all serve different purposes (some are communication-centric, others are for project management), but the bottom line is: they are all inboxes. In short, I’ve gone from running a business with 2-3 inboxes to running a business with dozens of inboxes, sometimes multiple inboxes for just one client. And it seems like we’re coming out with new inboxes all the time. Slack is relatively new, for example, and it’s touted as an email killer. Not surprisingly, several clients have jumped on board to use Slack instead of email. This will continue and it will grow as the next Slack and the NEXT Slack and the NEXT NEXT Slack is invented. I’M NOT TURNING INTO AN OLD MAN — I HAVE A LEGIT POINT! I swear — I’m NOT turning into a curmudgeonly old man. I realize that the level of client I now serve probably requires more complex communication and project management systems, and some of these systems provide value that email did not (such as versioning control). And to be frank, my business is far more complex and financially successful than in those simpler 2-inbox days so I definitely welcome the added features! It seems like we’re in an era of “anti-email” — where communication is being done in more specific, more robust software that is more attuned to a single purpose. But this new era of communication and project management causes me to wonder: is it better? 1. We’ve reduced emails but we haven’t reduced messages: We once had inboxes that BURST at the seams with hundreds of emails flooding in every day and that was overwhelming. I understand that the sheer volume of emails is exhausting. But here’s the point I think people are missing: we’re not reducing the number of messages we once had; we’re just spreading them across more inboxes. So instead of one big and daunting pile of emails (which is admittedly overwhelming) we have several small piles of messages in email, text, Skype, Facebook, Slack, Asana, Basecamp, Voxer, etc. 2. We are now paying an “invisible” price for this. We think we’re reducing email but we’re not — and now we’re ALSO paying a “switching cost” to check all of these different inboxes instead of just one. We now have to sign into several different inboxes to check those inboxes, communicate, etc. 3. We still use email for “important” things. Well, I don’t know about you but this is the case for me and my clients. We communicate on projects through all these various inboxes but whenever someone wants to raise the importance of something, they send an email. So email is still valued as a way to communicate but it’s become almost a place to indicate priority. 4. Even the anti-email mindset still benefits when there is only ONE inbox. It seems like people want multiple inboxes for different things, depending on the situation. They can have project management work in one set of inboxes and communication in another set of inboxes, etc. There’s this implicit idea that a single-inbox email is inefficient and old-school. Yet, how do you stay on top of all the notifications from each of these new and diverse inboxes? If you’re like most people I know, you do so through the notifications on your phone: each inbox has an app and each app notifies when there’s a new message. So all we’ve really done is take the single inbox value out of email and put it onto our phone. (But we still pay a “switching cost” to go from one app to another). There is a lot of value to these apps. I use them and I like them. For example, I’m a big fan of Voxer. And Asana is growing on me (although it feels like a lot of its features were crammed in as an afterthought without a ton of user-experience consideration — IMO). I think we’ll eventually* see a shift back to a single inbox in the future. We might not call it “email”. I predict that we’ll have some kind of inbox/dashboard/gathering-point, where all notifications will come into a single place from everywhere allowing us to review, sort, prioritize, and then launch into the right app. … and this single inbox/dashboard/thing will need to be device agnostic so it works everywhere — on our mobile devices (replacing the mobile device itself as an inbox) and also on our laptops (for those of us who use them for work). My mobile device is working just fine as a notifier but I’d like something on my laptop too (so that I can download files I need to work on, etc.) and I’m hacking something together with my Evernote inbox, email, and IFTTT. But it’s sketchy. In the meantime? I assume we’ll just keep piling on the apps every time a new supposed “email-killer” inbox comes out. And I guess we’ll just use our mobile devices to ping us every time we get a message. Eventually we’ll get tired of it and do something about it.